Alexander Klemm: Congratulations for your winning this tournament. How did you prepare for it and what do you think about your performance? Sune Berg Hansen: I didn’t make specific preparations for this tournament, I never do. But during the tournament I prepare a lot, which is the way I work nowadays, and of course I’m very happy about the result. It’s one of the best results of my career and the tournament was a wonderful experience. A.K. : What do you think about the format of the tournament with two double rounds at the beginning? Did you have enough time to prepare? S.B.H. : No, the early rounds you can’t really prepare, but that’s not really that important. The players you meet in the early rounds are not experienced international masters or grandmasters, so usually my normal play is good enough with these players. It’s tough opening with two double-rounds but in principle I’m not against double-rounds. When you play two double-rounds in a row it’s a bit like playing rabbit-chess, but it’s ok because it started the tournament off with a bang. A.K. How do you like playing in Bangkok? S.B.H. : I like the city, the people, the food, the hotel is nice and the organizers are friendly. The atmosphere is very good, and it is fun to play against so many nationalities. In the first round I played against a guy from Fiji, which is about the furthest you can go from Denmark. There are many Indians but no Russians, which is also funny. I definitely plan to play next year and maybe mix it up with a vacation in Thailand. Of course it’s very far from Denmark. It’s my first time in Thailand and I really like it. A.K. : Before you came here you probably heard about the political unrests …? S.B.H. : … yes, but it’s always more dramatic in the newspaper headlines. I remember I played a junior tournament in Riga in 1991, and on the day I took the plane Gorbachev got arrested on Krim, and when I arrived they were closing down the airport and tanks were rolling, but still it was a fun tournament and usually it’s not dangerous for tourists as long as they are careful. And here I saw a lot of demonstrators but they were very peaceful. If you are a bit careful you usually don’t get into trouble. Here in Thailand it’s civilized. A.K. : Have you had a chance to visit some historic sites? Would you like to visit some other cities? S.B.H. : Yes my girlfriend Christin Andersson [WIM from Sweden], who also played the tournament, and we saw the Royal Palace together. That was fantastic. And we saw the Chao Praya River. Some of my friends have recently moved to Thailand and I would like to visit them. They are professional poker players and have moved to Thailand because the climate is very nice, the people are friendly and of course it’s much cheaper than in the very expensive Denmark. A.K. : Let’s talk about chess in Asia. Usually you play in Europe, while here you had a chance to play against and watch Asian players from many nations. Asian players from many nations are getting stronger and more players join the world’s best. China, Iran and India come to mind. What is your perspective of the increasing popularity of chess in Asia and the raising number of strong results by Asians. S.B.H. 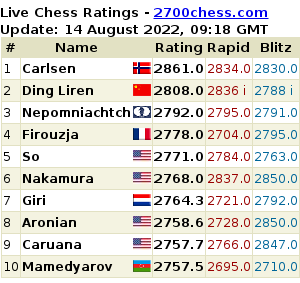 : They are clearly developing a chess culture in those countries. Of course they have more players and tournaments now than they did in the past, some players have trainers, Russian trainers for instance, and they are influencing each other. Before, a player could be the only one in his village, but now they have some kind of chess community, and they are receiving a cultural chess education. They are not playing the way they did back in 1978 when we heard about China and chess, and when the Chinese player Liu Wenzhe played in a wild way to win against Jan Hein Donner, a Dutch GM, [Wenzhe-Donner, Buenos Aires, 1978 1. e4 d6 2. d4 Nf6 3. Nc3 g6 4. Be2 Bg7 5. g4 h6 6. h3 c5 7. d5 O-O 8. h4 e6 9. g5 hxg5 10. hxg5 Ne8 11. Qd3 exd5 12. Nxd5 Nc6 13. g3 Be6 14. Qh4 f5 15. Qh7+ Kf7 16. Qxg6+ Kxg6 17. Bh5+ Kh7 18. Bf7+ Bh6 19. g6+ Kg7 20. Bxh6+ 1-0], and people were talking about the Chinese and how they were playing differently. They had not had all that much training and “good” techniques and positional style, but you can see that nowadays there’s no difference between the way Indians play compared to how Russians play. It’s almost the same. Of course Viswanathan Anand had a tremendous influence on Asian chess. He is the world champion and probably the most famous sports-person in India. And in China, too, people are proud to be part of a chess community and they work together. It’s very serious. A.K. : I believe board-games have always been part of the culture in these Asian countries, but then they discovered international chess. S.B.H. Yes, chess is called Shah, and I think this means “king” in India. A.K. : Which places in Asia would you like to see, and have you played any other tournaments in Asia? S.B.H. All of them. In Thailand I want to see Phuket. In China I want to go to Shanghai because I’ve heard it’s a vibrant metropolis now. I love big cities. I played the world championship in India in New Delhi in 2000, but I was eliminated in the first round. That was the only time I played in Asia but I definitely want to play more. When I play chess I try to make it to a sporting event that’s very interesting like the Olympiad or the World Championship. Alternatively, it should be an interesting country, a place I’d like to see. A.K. : I have heard that you are a semi-professional chess player now and that you spend more time and energy on poker. How did this interest in poker come about? S.B.H. : I’ve always played a little bit of poker, and then I discovered that you can play poker online. I never play live poker, I only play online, with my 30-inch monitor and my stats programs and I came to realize that there’s a lot more money in poker than there is in chess. In chess even when I was number 200 in the world and living in Denmark I could only make a very modest living from that position. In poker, however, if you are good enough, you can make a lot more and it’s fun. I think chess is the cleaner game because there are no variables, but poker is fun and it’s a very strategic game too. A.K. : Is the mind of a chess player similar to that of poker player? S.B.H. : Yes. I trained to become a good chess player and of course in that process I thought about how to learn and how to improve, and what you should focus on when you try to master the game. I took all of that when I started playing poker, so I was able to improve fast, although I’m already quite old, I’m in my late 30s now and I was in my mid-30s when I started. I changed my chess style also after I had started playing poker. Now I don’t play any openings on a regular basis. I choose the opening according to my opponent. If I think that this kind of opening or that kind of structure will not suit him, then I prepare it. And sometimes I even use six hours to prepare an opening I’ve never played before just to get a certain kind of position against an opponent. With white I open the game with knight to f3 or I play pawn to c4, d4 or e4, all to get my opponent into a position that is difficult for him. I think nobody has been doing this so drastically. Most people have their opening repertoire. With black I don’t have enough openings yet to follow this strategy so much. I’m still somewhat predictable but with white I do it and I’m doing it well. A.K. : How about coaching? You could increase your income my coaching young players. S.B.H. : Yes, I coach two talented Danish players and sometimes in the summer I’m part of a team that runs a chess camp for young Danish people, but I haven’t done any international coaching. At the moment I don’t have the time, maybe when I’m older. A.K. : What are your plans for the next couple of days? S.B.H. : Today we will go to the chess club to just hang out and talk with people. We didn’t have so much time to talk to the organizers. Tomorrow we’re flying to Dubai because we want to see the tallest building in the world. We’re regretting it a bit that we’re not staying in Thailand for five more days instead of going to Dubai but we will do that the next time. A.K. : I hope that you have a safe journey home and that you come back next year. Thank you for the interview. S.B.H. : I’m planning to come back. Thank you.